Letters: New Focus on the "Served Community"
Lake County (Florida) ARES Provides Radio Communications for the March of Dimes "March For Babies"
On April 19, 2014, the Hilo (Hawaii) Civil Defense held its first annual Tsunami Awareness Fair. East Hawaii District Emergency Coordinator Kimberly Fendt, WH6KIM, and East Hawaii Planning Assistance Emergency Coordinator Sean Fendt, KH6SF, represented ARES at the event. The pair spent the day showcasing their "off-the-grid" emergency response radio setup that included an inverted-V VHF antenna thrown over a tree, and a mag-mount 2m/70cm antenna mounted on a tower that was constructed from items around the house: a used satellite dish, a camera stand and a leg that had broken off of a canopy. The Fendts set up on all bands and modes including packet and ran their operation off of one deep cycle battery. They spoke to the public about the accessibility of Amateur Radio for the whole family and how it could aid in case of disaster. According to NOAA, a tsunami is a series of ocean waves generated by sudden displacements in the sea floor, landslides, or volcanic activity. In the deep ocean, the tsunami wave may only be a few inches high. The tsunami wave may come gently ashore or may increase in height to become a fast moving wall of turbulent water several meters high. Although a tsunami cannot be prevented, the impact of a tsunami can be mitigated through community preparedness, timely warnings, and effective response. In The US, NOAA has primary responsibility for providing tsunami warnings to the Nation, and a leadership role in tsunami observations and research. Click here for a NOAA presentation on the extent of the tsunami threat to the east coast of the continent. May 1, 2014 -- The Hurricane Watch Net is looking for additional net control operators. Hurricane Season in the Atlantic region begins June 1 and ends November 30, and in the eastern Pacific from May 15 until November 30. The Hurricane Watch Net typically activates on 14.325 MHz when an Atlantic Basin hurricane is within 300 miles of landfall, or at the request of the National Hurricane Center in Miami. HWN Manager Bobby Graves, KB5HAV, reports the net now is getting everything in place for its 50th straight season, and that includes signing on some new net control stations and net members. More here. On April 28, tornadoes hit Mississippi and Alabama. Eight died in Mississippi, while two died in Alabama, and another two fatalities occurred in Tennessee, near the Alabama line. Other states have also been impacted this season. ARES and SKYWARN reporting can be found here. The operators of WX4NHC, the amateur station at the National Hurricane Center will be active for their annual station test on Saturday, May 31, 2014 from 9AM-6 PM EDT (1300Z-2200Z). The group is commencing its 34th year of service to the center. The purpose of the event is to test station equipment, antennas and computers prior to this year's hurricane season, which starts June 1. This event provides good practice for radio amateurs world-wide as well as NWS staff to become familiar with protocols and procedures for communications available during times of severe weather. The WX4NHC leadership will also be performing operator training. Operators will be making brief contacts on many frequencies and modes, exchanging signal reports and basic weather data ("sunny," or "rain," etc.) with any station in any location. WX4NHC will be on-the-air on HF, VHF, UHF, 2 and 30 meter APRS and Winlink. Operators will focus on the recognized Hurricane Watch Net frequency 14.325 MHz and announce other frequencies when QSYing. Amateurs may be able to find the NHC station on HF by using one of the DX spotting networks. The NHC operators will also be on the VoIP Hurricane Net from 4PM-6PM EDT (2000-2200Z) (IRLP node 9219/EchoLink WX-TALK Conference node 7203). Local southern Florida area VHF and UHF repeaters will be worked as well. QSL cards are available via WD4R. (Please send your card with a S.A.S.E.) Please do not send QSLs directly to the Hurricane Center address, as they will get delayed. Due to security measures, no visitors will be allowed entry to NHC without prior clearance from the NHC PIO and security officials. With less than one month until the start of the 2014 Atlantic hurricane season on June 1, now is the time to prepare. To kick-start the preparedness effort, the National Hurricane Center, FEMA and other organizations, have come together to promote the National Hurricane Preparedness Week May 25-31. If you're using social media during National Hurricane Preparedness Week to share tips and activities, please use #HurricanePrep! You can also follow @Citizen_Corps and @PrepareAthon for more hurricane information during this week. Eight Prattville (Alabama) Army National Guard members from the 231st Military Police Battalion armory traveled to Fort McClellan (Anniston, Alabama) for specialized training in [Amateur Radio] earlier this month. The military is trying to bring back the use of HF communications in the service rather than having sole dependence on satellite communication. With today's email and cellphone communication, radios now are used primarily during natural disasters and emergency situations such as 9/11, Hurricane Katrina and Hurricane Sandy when high cellphone use can overload the satellite system. Special radio frequencies can [be used to] communicate with emergency management agencies during such times. Joel Black, a member the Region 4 Army Military Auxiliary Radio Service, or Army MARS, said [HF] radio is much more efficient than satellite communications. "Today's military has started to depend more on satellite communication. However, HF communications is a more rapidly deployable communication system," Black explained. "You can set up an antenna, tune into the right frequency and start talking within minutes. It takes much longer to set up a satellite system." Trying to set up a satellite communication unit in the field can be cumbersome for military members, Black said. Oftentimes, two men are needed to set up a 20-foot or 8-foot satellite dish, transponder and other equipment. The whole process can take up to two hours. Army MARS, which began in 1925, is a Defense Department organization of Amateur Radio operators that train on a daily basis for providing incident communication for both military and government agencies. On Saturday, May 3, more than 300 runners gathered for the annual Falcon 50 race on the US Air Force Academy campus in Colorado Springs, Colorado. The race, open to any valid military ID card holders including retirees and cadets, featured not only a standard 26.2 mile marathon in the challenging terrain and elevation of the USAFA that is nestled up against the Rocky Mountains, but also a 50-mile ultra-marathon and a rare military heavy marathon where the participants run in uniform, boots, and carry a 35 pound pack. Supporting the runners were 20 operators from the Pikes Peak Amateur Radio Emergency Service (Pikes Peak ARES). Co-manning the several USAFA cadet run aid stations along the route and a few acting as roaming "floaters," these operators coordinated with the race director and El Paso County Search and Rescue to track runners, arrange for supplies, provide weather reports, arrange for transportation, and dispatch aid. Relying on the same skill set used for responding to emergencies like the devastating 2012 Waldo Canyon fire, 2013 Black Forest fire, and 2013 Colorado flooding, the members of Pikes Peak ARES, which represents El Paso and Teller counties as Region 2 District 2 of Colorado ARES, used a combination of digital and voice radio systems to relay information between sites. Set-up in vehicles and tents, the operators were on the air first thing in the morning, powering their radios from batteries and solar panels. When the first runners came through, the radios started to come alive with reports of bib numbers as the lead runners set an impressive pace. Then the runners began coming through in waves and as aid stations ran low on supplies, calls went out to request more drink mix and food. As the race went on, some of the calls changed to reports of people who were dropping out due to injury or exhaustion, but working closely with the cadets, the ARES members were able to track and report everyone. Mike Procter, KB0IAP, works with an unidentified cadet at Aid Station 5 to track and report bib numbers of Falcon 50 participants. Photo courtesy of Bill Hecker, KC0ET. and the radio operators were able to pass corrections to the race director and his sweep team. Dan Martin, KD0SMP, the Pikes Peak ARES mission coordinator, stated that "the race director and his cadet organizers were getting conflicting reports from everyone else, but it was quickly ascertained that they could rely on our information for the clearest and most accurate picture of where runners were." 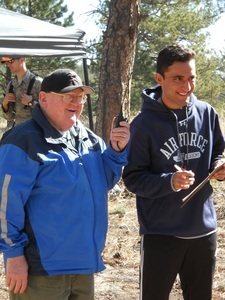 For many of the Academy cadets running the aid stations, this was their first exposure to ham radio and several were very interested in the ability to e-mail over the radio and the capabilities of Amateur Radio. During lulls, a couple of the operators were able to set up HF antennas and make a few longer distance contacts to show some cadets the versatility of Amateur Radio. I appreciate the focus you have been bringing in recent QST articles. I was active in leadership in Palm Beach County (Florida) ARES during our calamitous 2004-2005 hurricane seasons when we activated for four different storms. Based on that experience, we encountered challenges under the then-current ARES model, which focused on served agencies. Staffing was a major issue for us. Based on this experience, I came to the conclusion, further reinforced in the years that followed, that the ham community needed to turn its focus toward their own individual neighborhoods and communities. Now, I am more convinced than ever that the future utility of Amateur Radio in public service lies in the individual ham's immediate community - the "served community" as opposed to the traditional served agency model. The public still has little recourse when cell phones stop working. A ham can organize a communications system in his neighborhood, make it known that his is the door to knock on to get a message out, and when an incident happens, he can do what he is most likely to do anyway: hunker down with his family and protect them and his property, instead of being asked to make accommodations to leave all that is precious to him behind to drive through potentially hazardous conditions to a distant service point like an EOC or shelter to serve somebody else's needs. The Yavapai Amateur Radio Club provided communications for the 2014 Whiskey Off-Road Mountain Bike Event in late April, in Prescott, Arizona and surrounding mountains. 2,000 amateur and professional mountain bike riders participated in this three day event. Saturday's 50 mile race quickly became an actual emergency about an hour after it began when temperatures dropped with a mixture of rain, high wind, sleet, and snow. When the weather worsened, some of the riders dropped out of the race at the second checkpoint and returned to Prescott via a connecting road. Other riders continued on the race course until reaching the fourth checkpoint, where approximately fifty riders dropped out of the race due to the worsening weather. A number of these riders developed hypothermia. Event communications operators quickly went into evacuation mode and all checkpoints were contacted by net control to determine the number of riders needing transportation back to Prescott. Net control worked with race, search and rescue, and other emergency personnel to coordinate transportation to evacuate these riders. Personal vehicles and a bus were used in the evacuation. While awaiting evacuation transportation to arrive, Amateur Radio operators and other race personnel manning the checkpoints gathered some of the riders suffering the most in their vehicles to warm up. The race continued and event communications were used to locate some missing riders. Once things settled down, the net went back into getting race updates from the checkpoints and everyone was brought in safely, albeit a bit cold. The abandoned bikes were all picked up and returned to the event center. Despite the difficult conditions, well over 300 riders completed the entire 50 mile race course. The weather front broke later in the morning and the second race was started around noon. The race officials did shorten this ride from the planned 25 miles to a 15 mile event and it finished with no major incidents. Following 9/11 and Hurricane Katrina, Oklahoma, as well as the other states, received grant money to purchase all types of equipment to ensure interoperability of voice and data to support communications across county, state, tribal and regional boundaries in response to the above-mentioned types of events. In addition, funds for training were set aside to bring multiple agencies together and teach employees how to best utilize the equipment for events and exercises. There have been many COMT classes taught across the United States over the last few years. While on assignment for this specific course, I had the opportunity to arrange a tour of the Storm Prediction Center in Norman, Oklahoma with the help of Lans Rothfusz, Deputy Director, National Severe Storms Laboratory at the facility. The SPC building is the largest of any NWS office, having five floors with 244,000 square feet and includes a well-equipped Amateur Radio station. Oklahoma had five significant tornadoes in 2013, including 2 EF5's. The Lake County, Florida ARES provided radio communication in support of the March of Dimes Walkathon in Tavares, Florida on Saturday May 10, 2014. Fifteen volunteer ham radio operators donated their time, vehicles and equipment for the event. The Lake County ARES communications trailer was set up in Wooton Park in Tavares on the shore of Lake Dora on a beautiful sunny morning adjacent to the event start/finish line. The walkathon course was approximately five miles long and had 250 participants. Six rest stops were provided along the route sponsored by local businesses from the Tavares area such as banks, medical services and service clubs. An Amateur Radio operator was stationed at each rest area with a hand held radio, which enabled each spot to be in contact with the net control station N4FLA in the communications trailer. The ARES personnel also provided three vehicles with mobile radios to make sure the walkers were safe along the route and to transport anybody who could not finish on their own back to the event headquarters tent. These vehicles were also dispatched by net control to deliver ice and water to rest stops that requested them. Lake County ARES was able to test a new Digital Mobile Radio system (DMR) for this event for the first time. Lake County Emergency Management loaned the ARES operators Motorola XPR 7550 hand held radios to stay in contact with the net control station, which was using a Motorola XPR 5550 base station. This successful test added to the many communications systems the ARES group can call upon in the event of an emergency situation. Hospitals drill regularly to plan and prepare for mass casualty incidents and communications outages, and in 2010, a petition for rulemaking filed with the FCC by the American Hospital Association resulted in the Commission making an exception to the prohibition on communications in which the operator has a pecuniary interest (including communications on behalf an employer), so that an operator who is also a hospital employee could participate in his/her hospital's emergency/disaster drill up to a total time of one hour per week (and except that no more than twice in any calendar year, they may be conducted for a period not to exceed 72 hours). As a staff Registered Nurse (RN), this ruling allows me to participate as an Amateur Radio communicator for my hospital's drills and exercises without worrying about breaking the FCC's Part 97 rules. Hospital employees/Amateur Radio operators such as myself are likely to remain at work 24/7 for the duration of a major disaster; for example, hurricanes are issues for us here on the Atlantic coast of the Florida peninsula. If one were to hit the Daytona area, I would be required to stay at the hospital, riding out the storm and its aftermath meeting the medical needs of critically ill patients. With my expertise and experience of the hospital's communication systems, I would likely be called upon as a radio amateur to provide both internal and external emergency safety of life back-up communications as administrators deem required. My go-kit is organized in small Pelican cases clipped to the back wall of the cab of my pickup truck, which would remain parked in a protected hospital parking garage, readily available, for the duration of the acute and recovery phases of the incident. My pick-up truck would be parked on the highest (but safe) level of the garage for maximal line-of-sight coverage to area FM and D-STAR repeaters, and of course, simplex coverage if repeaters are down. Hospital staffs are exceptionally sensitive to patient privacy issues under the above rule, not only on legal grounds, but morally and ethically as well. Hospitals continually train and sensitize doctors, nurses, and other staff for the critical need to protect patient's medical records. Termination and lawsuits are the consequences of careless handling of patient information and breaches of confidentiality. ARES operators in a health care center environment are advised to take such sensitivity training as well and coordinate issues with administrators. And finally, a follow-up note on last month's item on the Bishop (California) Amateur Radio Club's participation in the California statewide exercise: Dr. Rick Johnson, the public health officer for Mono and Inyo counties, was quoted in a media report as saying "the Amateur Radio operators are even more important now, as the Town of Mammoth Lakes reels from losing almost all of the employees that have institutional knowledge of how to respond to an emergency." Other town emergency functions are short-staffed, "so ham radio operators are a big asset. We hope they will be an even greater part of this in the future." Dr. Mike Karch, a Mammoth Hospital orthopedic surgeon just back from a medical mission to the Philippines after Typhoon Haiyan was quoted: "Ham radio technology can fill a gap like nothing else can in a true emergency. Over and over again, we find the lack of communication to be as dangerous, or more, than the things we think of as dangerous, such as falling buildings or disease."